I should have paid more attention during my high school French classes, but since I was too busy passing notes with Heidi Van Den Aardweg and another girl named Stacey (her last name escapes me, but she had pretty freckles and looked like Mia Sara), I'm not quite sure what Sandra Avital does, since her blog is entirely in French. Is she a chef, a baker, or a photographer? 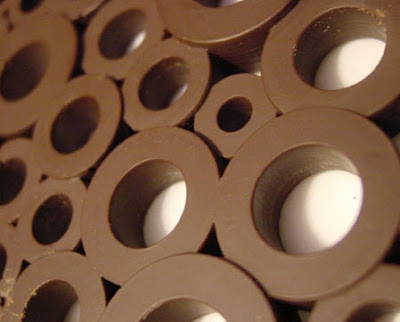 Either way, her love of chocolate needs no translation, as her artful blog Le Pétrin can attest. 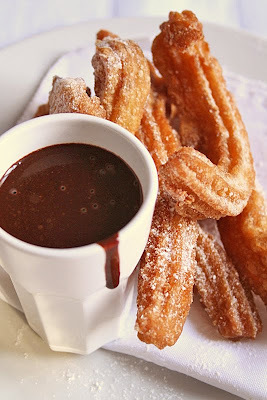 Particularly fascinating are her pictures of chocolate-dipped foods, like the chocolate dipped zeppole, pretzels, and churros featured here. 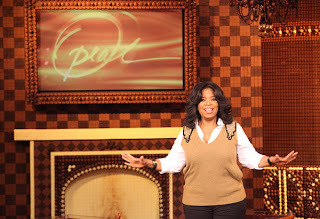 No one goes “big” like Oprah Winfrey. 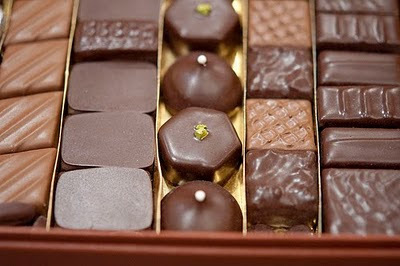 The departing Queen of Talk hosted Monday’s show “That’s Incredible!” on an all chocolate set. 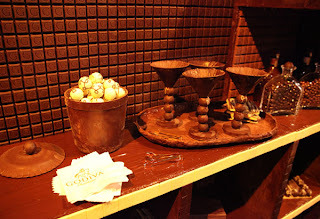 The setting included a grandfather clock, table, books, chess set, fireplace, vase of flowers and chandelier -- all made of Godiva chocolate. 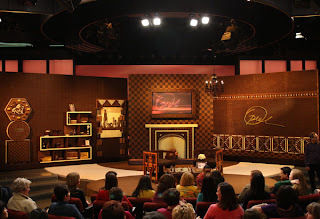 At the end show (which included a visit from the world’s tallest dog) Oprah invited the audience on stage for a taste the set which was built using 7,000 chocolate bars and 2,400 truffles. 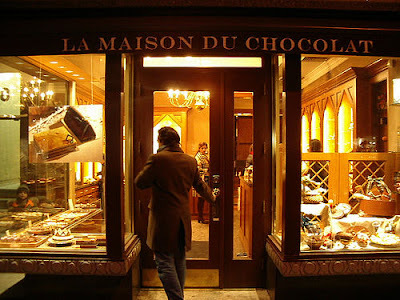 The first batch of pain au chocolats at Patisserie Claude in New York's Greenwich Village usually sell out by 10:00am every morning. That's how good they are. 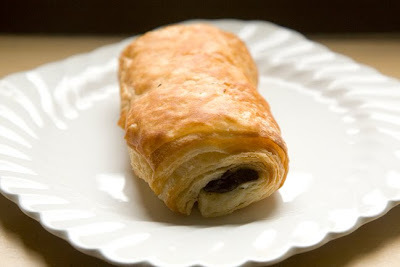 Last week, I got there too late to catch the first batch, but decided to wait twenty minutes for the second batch and had the distinct pleasure of eating the pain au chocolat you see above just minutes after it came out of the oven. 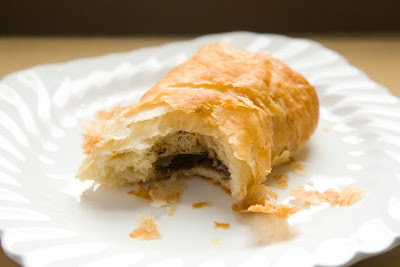 It was pure unadulterated heaven, with just the perfect proportion of rich, dark chocolate melting into buttery, flakey pastry. More importantly, it reconfirmed my opinion that even after the legendary Claude retired last year and his longtime apprentice Pablo took over, this place still makes the best pain au chocolat in the city. 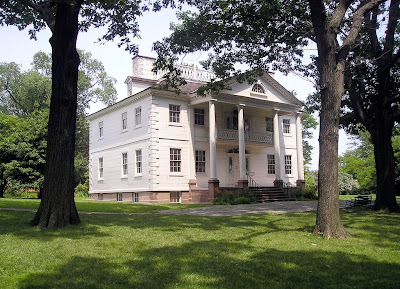 Head Uptown (way uptown -- 163rd Street) this Saturday to the historic 18th century Morris Jumel Mansion, Manhattan's oldest house, and learn about the role of chocolate in early America. 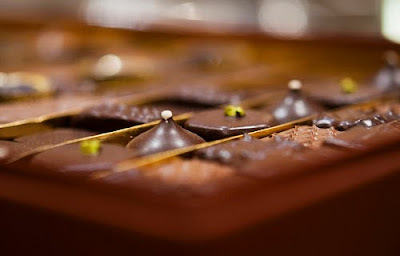 Carol Ward will present a lecture entitled “Social Drinking in 18th Century France & America.” Then watch as Susan McLellan Plaisted creates chocolate using tools and techniques that date back 2000 years. Tickets are $20 per person, $15 for members and $10 for children. Advanced registration is required. Call 212-923-8008 for more information. 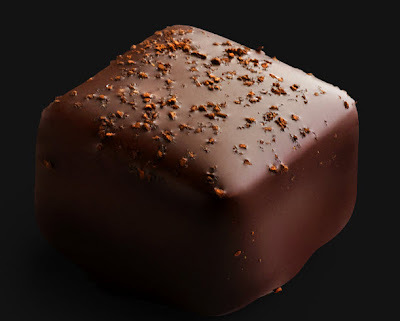 Reine Astrid's Caviar de Chocolat isn't actually caviar, but tiny lumps of caviar-shaped 52% cocoa grains that you mix with water or milk to create a luscious molten hot chocolate. 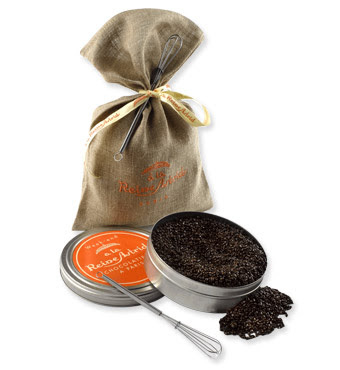 The caviar set comes in a beautifully embroidered linen sack, and includes a tin that's cleverly designed to look like a canister of the finest Russian Sevruga, and a mini whisk perfect for whipping it up into a decadent liquid treat. Alexis Carrington would surely approve. 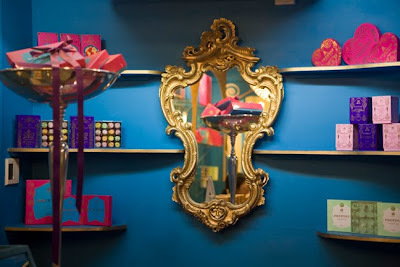 Located in the old Essex Market on New York's Lower East Side, it's completely out of my way, and a real pain to reach before closing time -- but have amazing chocolate, will travel. 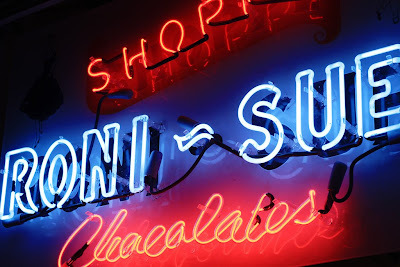 I travel for Roni Sue's chocolate. 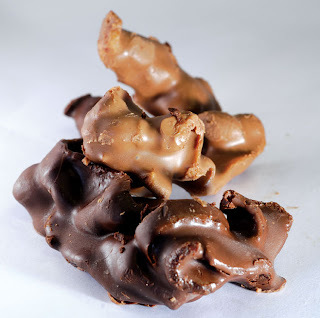 Specifically her decadent combination of pork and chocolate known as "pig candy" -- whole fried bacon strips dipped in dark or milk chocolate. The current issue of Edible Manhattan has a great interview with the princess of pork, and discovers how the 56-year-old mother of two found her sweet spot. 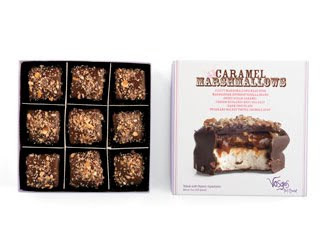 As they say, "God is in the details," and Vosges Caramel Marshmallows are a testament to this. 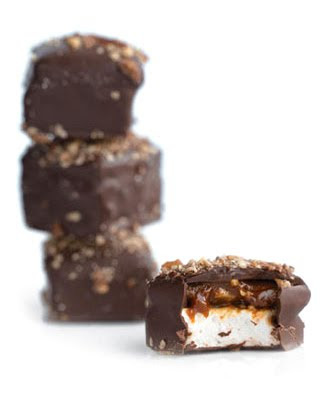 Fluffy marshmallows made with Madagascar bourbon vanilla beans are combined with sweet caramel and dark chocolate, and finished off with a sprinkling of Bapchi's Caramel Toffee bits and French Guérande grey sea salt. 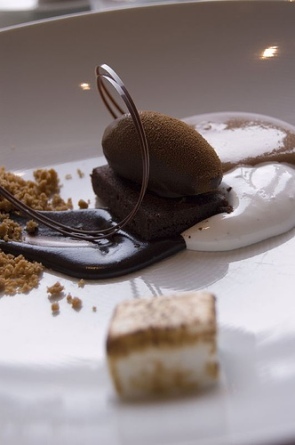 The result is simply the most decadent re-invention of the s'more that I've come across. High design meets traditional Italian chocolate in the striking Lagrange34 collection. 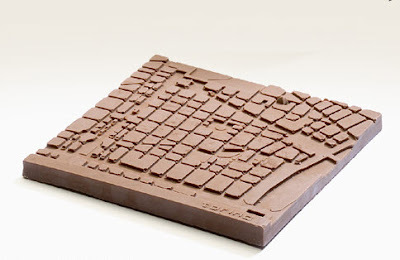 A collaboration between interior and product design firm Jjuice and chocolatier Pasticceria Gertosio of Turin, the resulting bars brilliantly exploit the potential of chocolate as a medium for art. 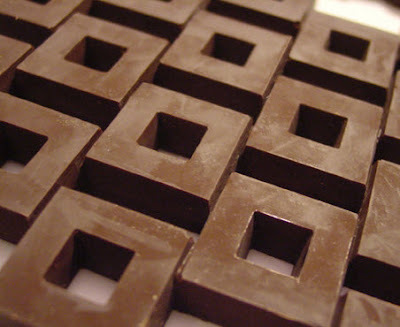 Bar no.3, Extra Dark Chocolate bar. Bar no. 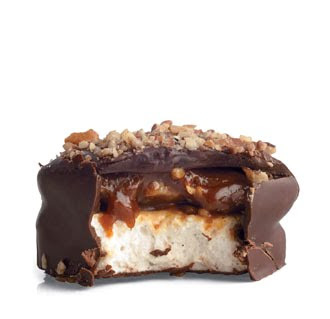 1, Milk Chocolate bar. Bar no. 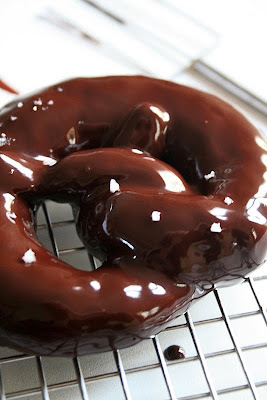 2, Dark Chocolate with Cinnamon. 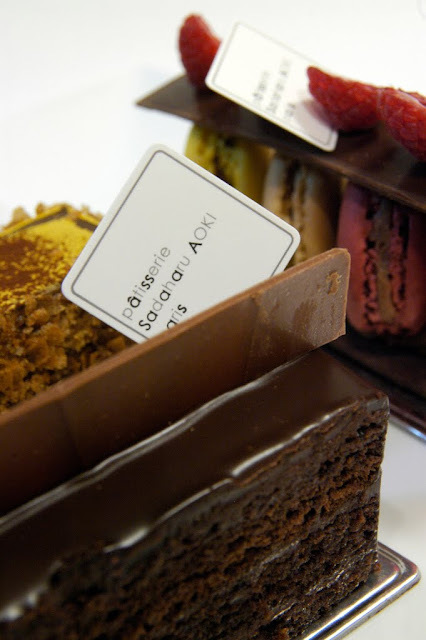 Julie Lightbourn, the chef of Harbour Island's most celebrated lunchtime spot, SipSip, writes: "A guest arrived today from London bearing an insulated handbag, which held a precious box of bite-sized choccies from La Maison du Chocolat. They are loverly...and so is the reusable bag, which I adore. They don't come with a map like the Whitman Sampler, so I have no idea what I am eating--I just know that I'm in quality hands! 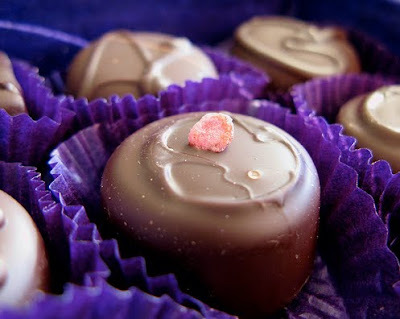 I have been advised to consume all of the chocolates in a week or so..."
I'd much prefer to recieve my Valentine's day flowers this way. 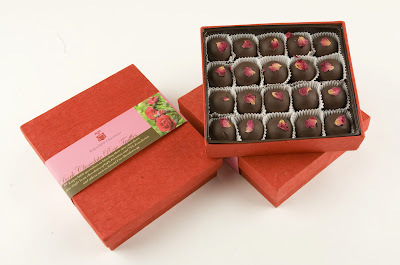 Fritz Knipschildt's beautiful handmade red paper box contains 20 of the chocolatier's wonderous truffles, each filled with rose water infused dark chocolate centers and topped with a tiny edible rose petal. 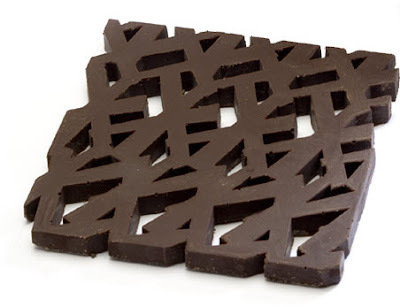 Chocolate Editions by Mary & Matt are made in small, handmade batches that combine elemental flavors with a pop art sensibility (Mary used to work design, and Matt in advertising). 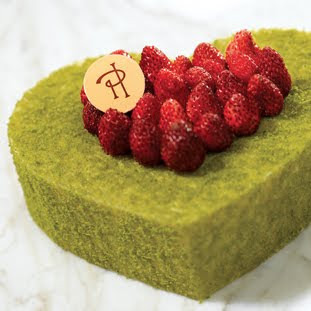 For Valentine's, they've created this strawberry and dark chocolate bar set inspired by Chaka Khan's classic song, "Sweet Thing." 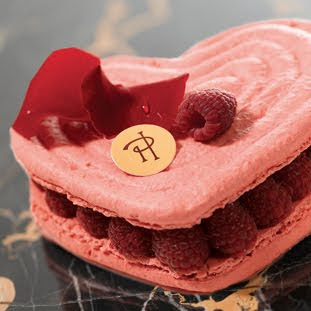 Fall in love with these limited edition Valentine's day confections from Pierre Herme. 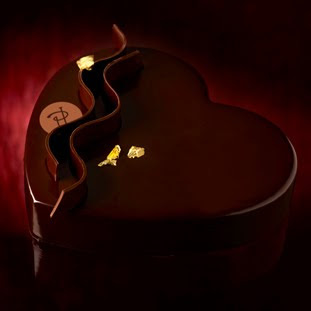 This gorgeous offering from Kansas City's own world-class chocolatier contains 5 hand painted hearts filled with carmel infused with raspberry, red and passionfruit. 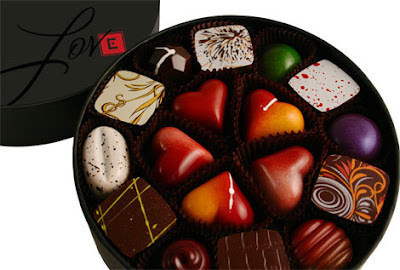 The hearts are surrounded by 12 additional pieces of handmade seasonal chocolates. 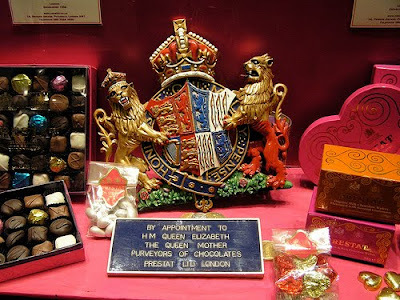 Prestat was officially granted a Royal Warrant in 1975 as "Purveyors of Chocolates to the Queen," but unofficially, they were supplying chocolates to England's royal family for decades before that. 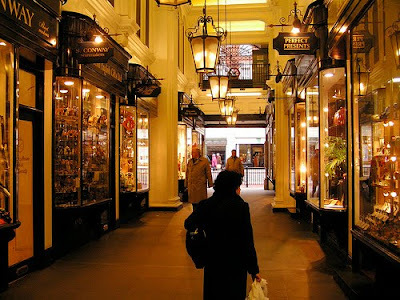 It's no wonder that the shop itself is a jewel box of a space tucked away in one of London's most enchanting arcades, the Princes Arcade on Piccadilly. 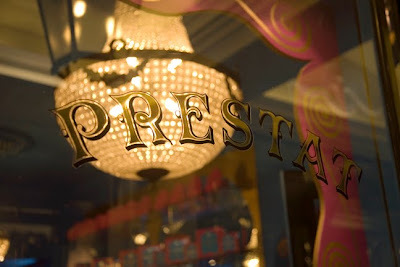 Their chocolates were also a favorite of author Roald Dahl, whose classic book My Uncle Oswald is all about what happens when a love potion hidden inside Prestat Truffles is unknowingly eaten by a host of 20th Century figures such as Freud, Picasso, and Nijinksy. 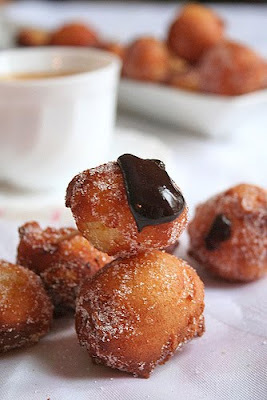 This may look sinfully decadent, but just think: it contains chocolate, coffee, and cardamom, three key foods that have been much lauded for their health benefits. So one of these a day should keep the doctor away. 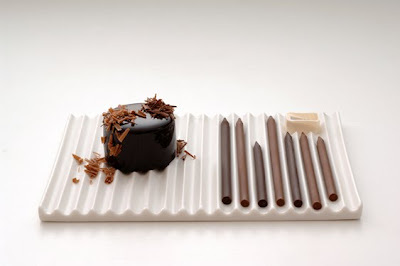 Designed by Nendo in collaboration with pastry chef Tsujiguchi Hironobu, of Le Chocolat de H, the Nendo designed plate cradles chocolate “pencils” which come in a variety of blends. 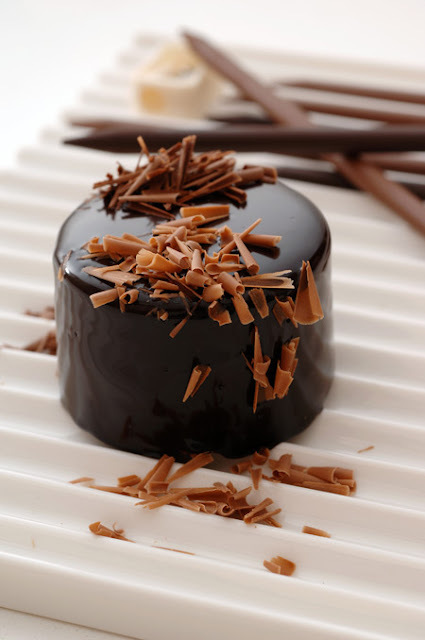 A special pencil sharpener comes with the plate and can be used to grate chocolate on top of pastries and desserts. 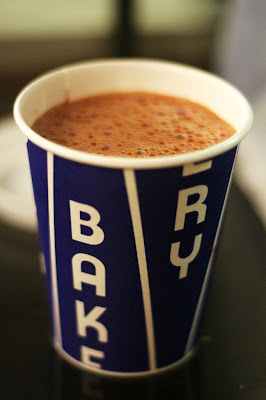 The month long celebration begins today with lemon hot chocolate. There's new flavor each day, so plan your hot chocolate consumption for the next 28 days by checking out their calendar of flavors.